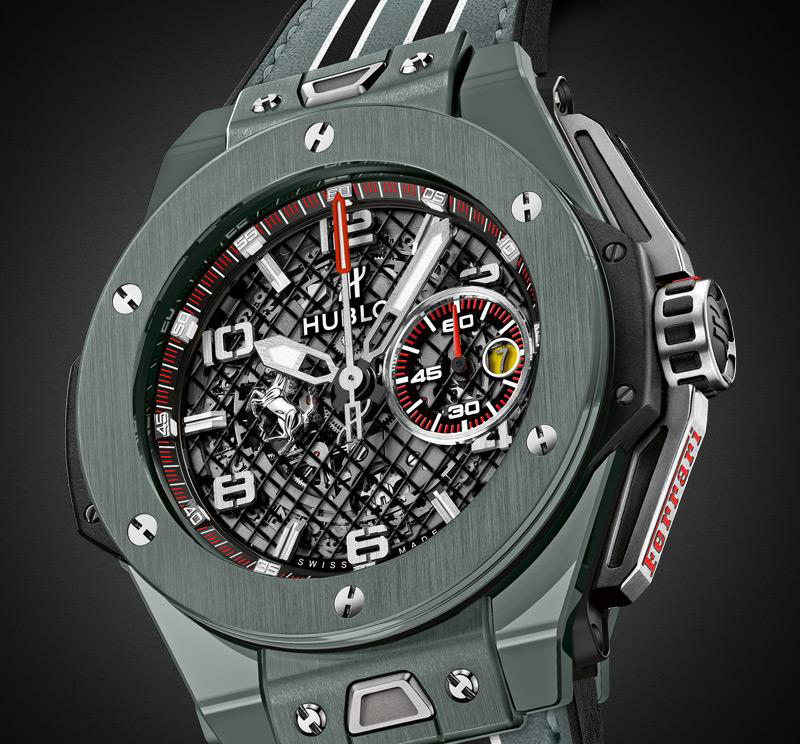 Hublot presents two new limited-edition Ferrari watches – Big Bang Ferrari Black Ceramic and Big Bang Ferrari Grey Ceramic. Considering Hublot is Ferrari’s official timekeeper since 2011, it’s quite common for the two companies to collaborate every now and then and launch a new edition. 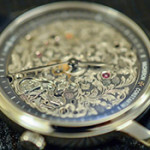 Most of the new watches they released are limited editions pursuing the image of uniqueness and exclusivity of both brands. 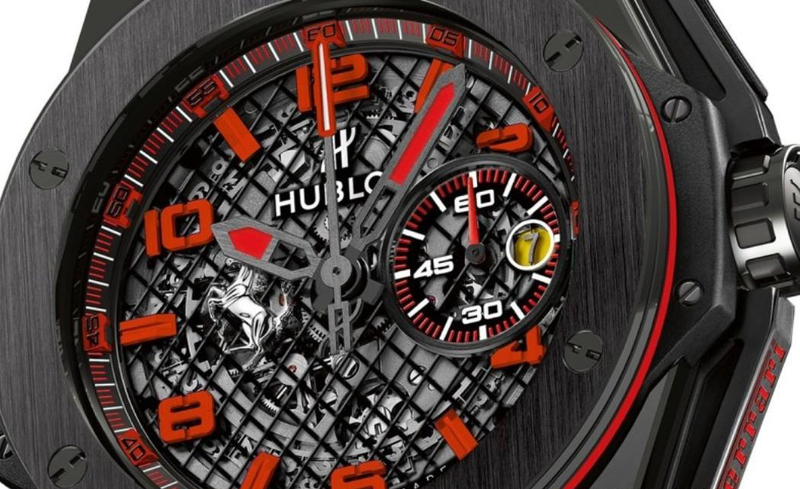 However the third year of Hublot-Ferrari partnership is coming to an end. To celebrate the 10th anniversary of the Big Bang, Hublot is launching two new exceptional Ferrari timepieces – The Big Bang Ferrari Black Ceramic, embellished with details in red color – the color of an iconic Ferrari. The Big Bang Ferrari Grey Ceramic, that pays tribute to the North America Racing Team livery. 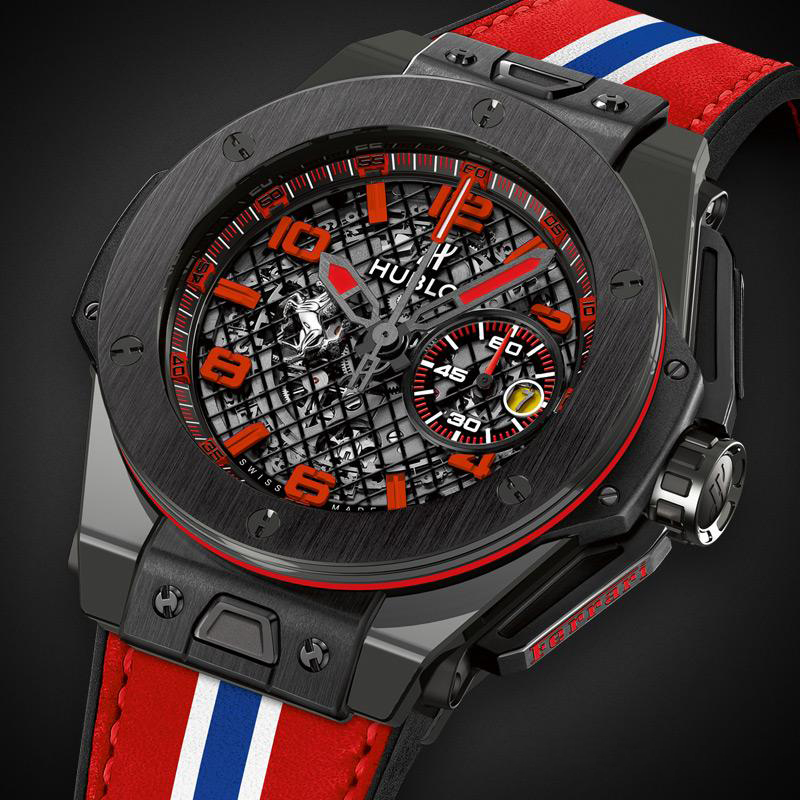 Both version of the new Hublot Big Bang Ferrari watches come in 250 pieces each and offer a 72-hour power reserve. Build on a 45 mm diameter chassis in black or grey ceramic, the ostentatious design of the new Hublot Big Bang Ferrari models is enhanced by a profiled aerodynamic dialog through which the movement can be seen. The movement is dominated by the specific Ferrari grille – a blackened criss-cross mesh clutter clearly reveals the main plates and the bridges of the movement. The case center incorporates push-buttons in titanium and rubber, fixed to a rotating staff like the pedals of a car. The iconic Ferrari’s Prancing Horse sits at 9 o’clock, while the minute counter and date window appear at 3 o’clock in the colors of the Italian super cars manufacturer’s shield. 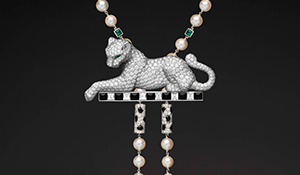 The strap features a rhodium-plated finish for the grey ceramic and red varnish for the black ceramic. It is equipped with the innovative “One click” attachment system inspired by car seat belts, making it easily interchangeable. Similar to the Ferrari wheels, the oscillating weight is visible beneath the transparent sapphire case-back.